Dewsbury Rams coach Lee Greenwood will look for his side to build on an encouraging opening performance against York City Knights when they welcome Swinton Lions to Tetley’s Stadium in the Betfred Championship on Sunday. 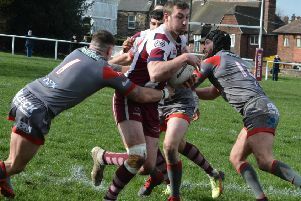 The Rams twice looked to have the game won against York as they first built a 16-0 lead and then, having fallen 18-16 behind, grabbed a 71st minute try to regain the advantage. The Knights struck three minutes from time to seal a 26-22 victory and although Greenwood took positives from the game, he knows the Rams must be smarter in closing games out. Speaking after Sunday’s defeat, Greenwood said: “I said from day one, lets make us difficult to beat here. “It was difficult for York to win here, lets be honest, they had to come back and win it. “The initial feeling is disappointment because we want to win games here and when you are in a position to win a game twice it is disappointing. “I think there are some old habits in there which we need to work hard on so that we can close games out and win them. Dewsbury have further boosted their ranks with the loan signings of three players from Super League clubs, as Callum Field joined on an initial one month deal from Wigan Warriors, while Chris Annakin (Wakefield) and Owen Harrison (Hull KR) were also in the squad who faced York. Greenwood added: “We are not dual-registering here. I know some clubs to and that is up to them but we won’t so that means when you get (players) you get them, on loan for a month at least, so that is what deal they are on. “It is not ideal in some respect bringing lads in who haven’t done pre-season but they are obviously at full-time clubs so their general fitness should be there. Swinton arrive at Tetley’s Stadium having lost their opening two Championship fixtures as they were thrashed 64-10 away to Sheffield Eagles on the opening day before suffering a 31-12 defeat to Bradford Bulls las Sunday.